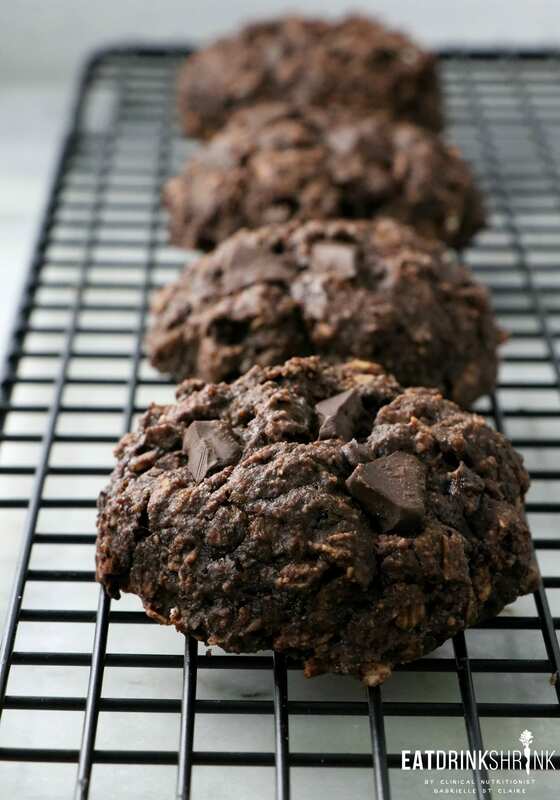 Vegan Double Dark Chocolate Peanut Butter Oatmeal Cookies - Eat. Drink. Shrink. I’ve been trying to cut down on posts to keep them to 3 per week, but these concepts are just so easy that you don’t even need a video tutorial! Whenever I find recipes I love, I always explore variations! 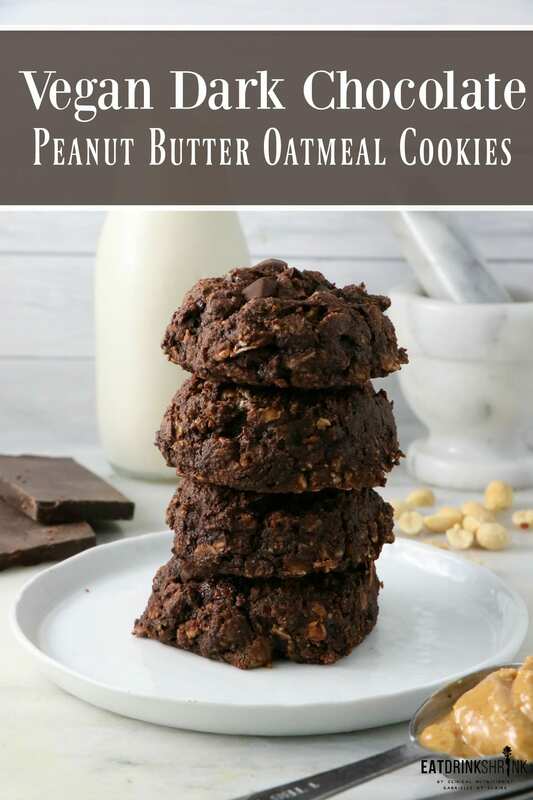 This past week, I was on an oatmeal cookie binge as they are just so effortless and can make for a perf snack or dessert being packed with protein, fiber, and more! In all honesty, when it comes to chocolate I enjoy it, but I never crave it (gasps! ), unless it’s combined with coffee grains. As weird as it sounds, coffee truly brings out the flavor in chocolate and also packs it’s own benefits to the body. 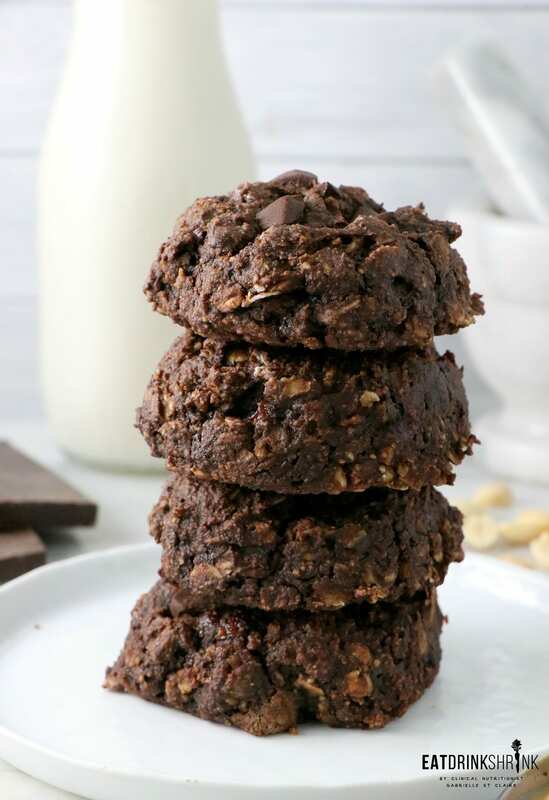 What I love about these oatmeal cookies, is everything! 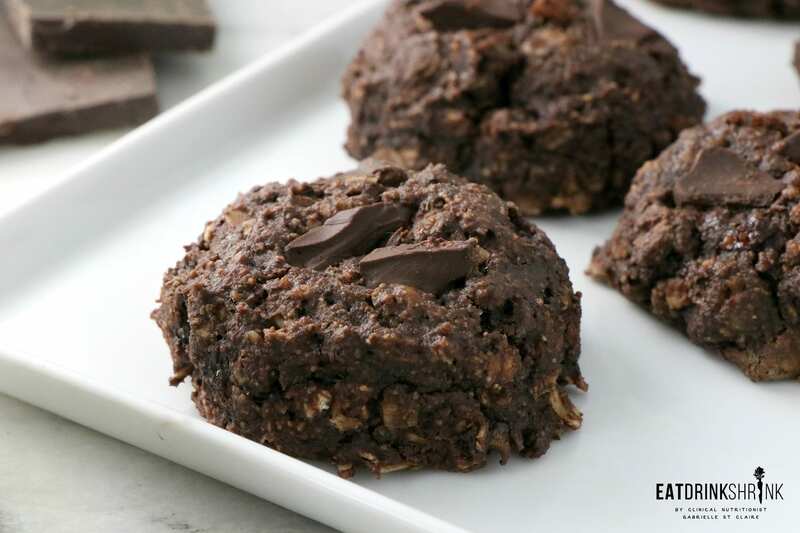 Quick, easy, filling, involve minimal ingredients, can be made with almond butter, you can switch up the flours and opt for gf, perf for any season, can easily be made in bulk (meal prep) and are non vegan approved!! 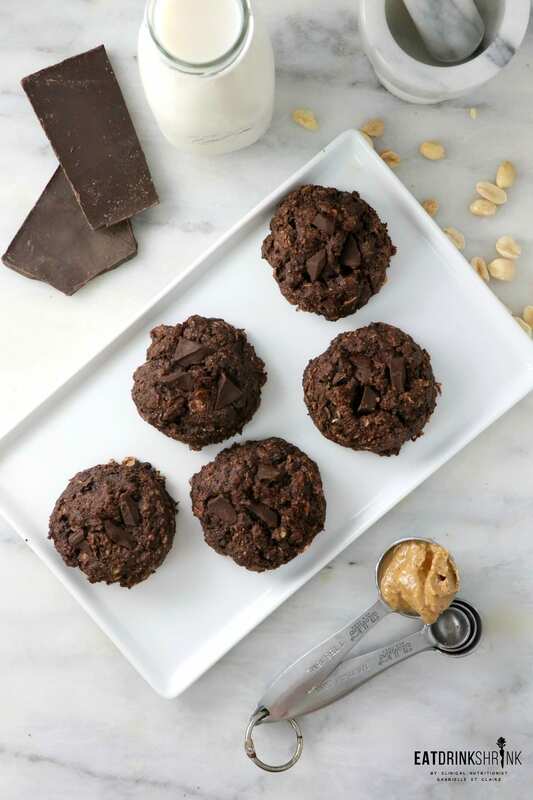 If you love effortless vegan bites you have to try this recipe for vegan Dark Chocolate Peanut Butter Oatmeal Cookies!! Coffee brings out the chocolate! Preheat the oven to 325. 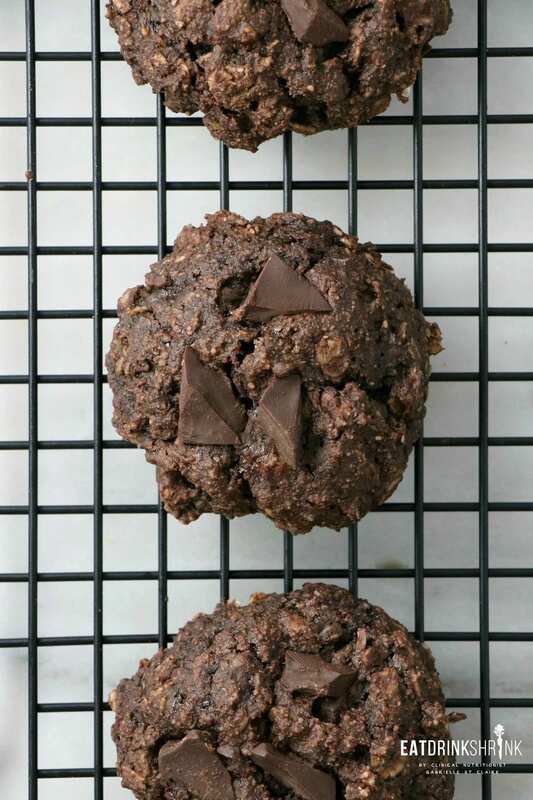 Whisk together all of the dry ingredients: oats, flour, cinnamon, coffee grains, coco powder, baking soda, baking powder, and salt in a medium bowl. In a separate bowl, whisk together the wet ingredients: melted coconut oil, banana, maple syrup, peanut butter, and vanilla. 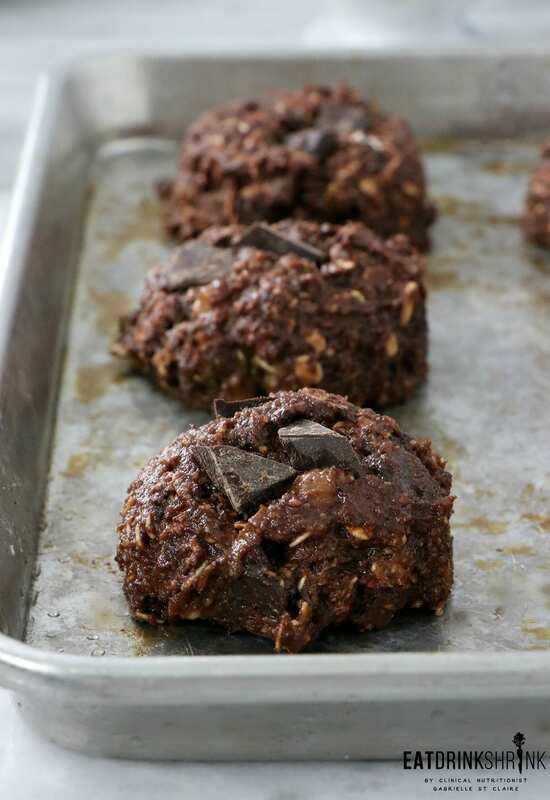 Using a spoon and spatula, drop the cookie dough into 6-8 rounded scoops onto the prepared sheet, ensuring that the mounds are as tall as they are wide. Bake at 350°F for 8-10 minutes. Cool on the pan for 10 minutes before turning out onto a wire rack. If they feel soft at first they'll harden as they cool. If you overcook them they can be too dry.